The Enterprise approaches Sigma Iotia II a planet that was visited by a human crewed starship a century previously, fearing cultural contamination Kirk has been sent to investigate. They receive a signal from the planet from a man calling himself Bela Oxmyx with an invitation to visit, Kirk accepts and calls for Bones and Spock to join him. They beam down onto a street which looks like a typical American locale with vehicles and outfits which match the late 1920's era, nearly everyone seems to be armed and soon two men approach and take the landing party captive. As they lead them away a car roars by and a machine gun opens fire, one man dies and the rest make their escape and proceed to Bela Oxmyx the "boss". He's overjoyed to see the "Feds" who are from the same organisation as those of the Horizon but he is not dealing in good faith, he demands a supply of "heaters" so he can remove the competition. 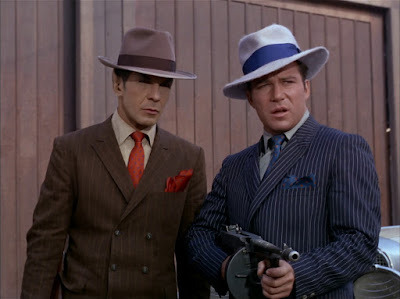 Spock sees a large book on a pedestal entitled "Chicago Mobs of the Twenties" and indeed this book along with some basic text books have been used to shape this culture into what it is today, devoid of civil government but a number of organised crime families who run everything. When Kirk refuses Bela he tells his goons to put them away somewhere safe, they are taken to a warehouse under guard and Kirk ingratiates himself into the goons card game by mildly insulting them, he then goes onto to invent the mind boggling "Fizzbin" card game and once distracted the landing party subdue the goons, Spock and McCoy return to the ship and Kirk grabs a gun and heads back to Bela's office. He doesn't get far before being waylaid by a goon working for the rival boss "Krako" who then pretty much demands the same concessions from Kirk, he refuses again and is locked up but escapes. Spock and McCoy beam back down to negotiate with Bela who takes them prisoner again but Kirk turns up, disarms everyone and steals their suits. He and Spock then raid the officers of Krako, get taken prisoner again but Kirk is able to get Krako beamed onto the ship and during the confusion they escape and make their way back to Bela. 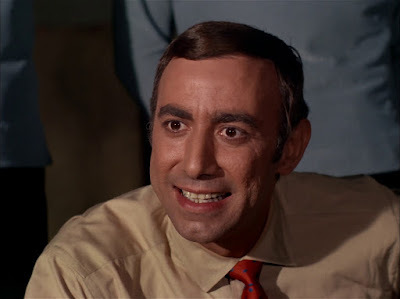 Kirk then plays the part of a "boss" himself working for the Feds, he informs Bela and Krako that the Feds are taking over and if they play ball they could get a piece of the action. Bela calls each of the bosses in turn and Scotty tracks the signal and beams them into the room where Kirk lays down the law but when some goons turn up and questions begin to be asked he has Scotty use the ships phasers on low power to stun everyone around the block and demonstrating the power of the Feds. Bela is made boss with Krako second in command and Kirk promises the Feds will be back in a year to pick up their 40% of the planets profits. A Piece of the Action begins with the surprising news that the Federation has only just learnt about the cultural contamination by the Horizon a century after the ship was destroyed, standard radio signals had only just been picked up but you still have a small question over the reckless nature of the space fleet back then, we assume the fledgling Starfleet was still playing with a prime directive. More surprising is that the planet contacts the Enterprise, not quite sure how they managed that but not to worry this Bela guys sounds reasonable so much so Kirk doesn't take any security with him. Always enjoyed the Paramount backlot this time in classic gangster era guise and my oh my the young woman certainly wiggled when she walked, I'm sure Kirk and McCoy were feeling right at home until of course the tommy gun wielding goons appeared. We then get a classic drive by which was done very well, a rather high energy dramatic sequence for the show and just to add the cherry on top two I assume ladies of negotiable affection accost the surviving goon demanding that the "percentage" they pay should be funding better street conditions etc. I've to admit that this "tax" in everything but name would work in theory, a good boss would make sure those who paid for his protection/favour got a return making the cost a worthwhile investment and allowing the local society to flourish. We then meet Bela who makes it a point to show off his "dame" and his well total lack of skill on the pool table but the clash of expectations makes for good drama and of course we see the "book" which has caused this culture to embrace this aspect of US culture. "Chicago Mobs of the Twenties" was left behind by the Horizon and it seems to have become the bible for this culture dictating how they should live and interact with each other, it hamstrings them in many ways but has certainly empowered the growth of this worlds technology. 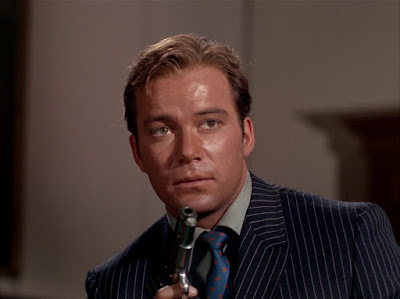 One thing you do quickly realise is that Shatner and by extension Kirk is having a lot of fun hamming it up, even introducing "Fizzbin" was a scene worthy of any comedy/drama of the time, it was inspired and shooting Kirk and the goon up close just added to the impact of the scene. Brace yourself now, Krrk is going to drive a manual motor vehicle. The grinding of gears puts a smile on your face, the reverse and crunch has you laughing and then the stop/start progression through the streets is just ridiculously funny but we're not done there. Kirk is approached by a youngster who realises they are going to hit Krako and offers his services as a distraction for a piece of the action, nice touch that. The writers must have been on a roll, the guys return to the car and it's Spock deadpan saying when Kirk sees his is a little concerned that it's Kirk driving that is alarming. 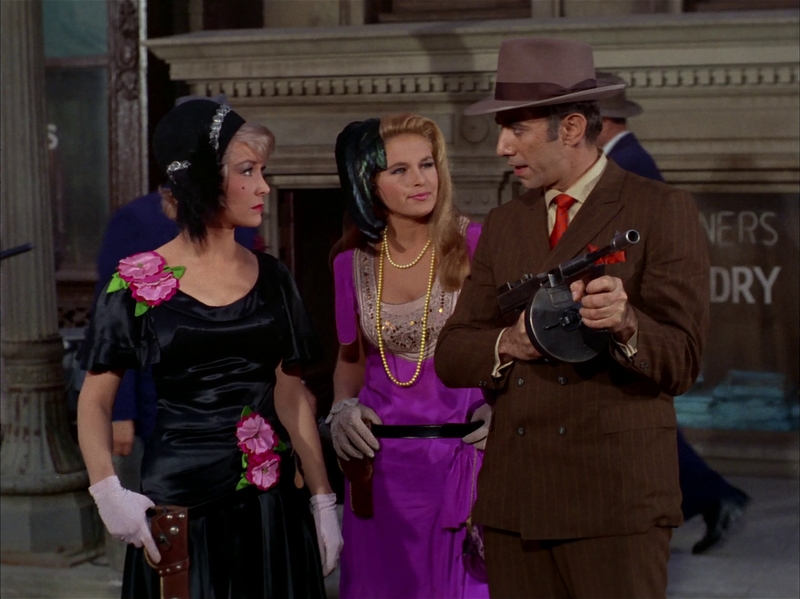 The story begins to wrap itself up when Kirk is in full on gangster mode, he forces his personality onto the situation and the bosses and goons respond and only question the path they are being led down when the shooting starts outside. Lucky I guess the ship's phasers can be set for stun since it offers a very clear demonstration of the consequences of not playing ball with the Feds and so the deal is done by raising a glass. Oh and McCoy left his communicator on the planet, clever piece of writing and who knows where the franchise would be if that loose thread had been pulled years later.